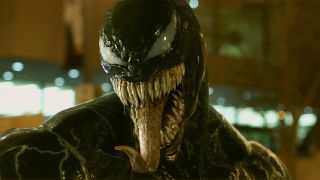 Venom has always been one of the most popular antiheroes in the Marvel stable, but he didn’t exactly fulfil his big-screen potential in Spider-Man 3, his only movie apperance to date. That’s all set to change, with Tom Hardy playing Eddie Brock (and his snarling symbiote side) in Sony’s upcoming movie. With Venom taking centre stage here, rather than being relegated to ‘supporting villain’ duties, the film will explore his split personality, head-chomping tendencies and dark sense of humour, if the Venom Comic Con footage is anything to go by. Setting up the character independently from Spider-Man, the film is an origin story for Hardy’s tenacious journalist Eddie Brock, whose investigation into the mysterious (and probably nefarious) Life Foundation leads him into contact with the aforementioned alien symbiote, which takes residence in his body, with a number of alarming side effects…. For more on Venom, including more from Hardy, Fleischer, Riz Ahmed, and Michelle Williams, pick up this month’s Total Film magazine, which hits shelves August 24. Better yet, why not subscribe and never miss an issue? Doing so will net you a fancy (not to mention exclusive) subscriber’s cover each month, such as the Venom one below, which current subscribers will already have their hands on. Plus, My Favourite Magazines will deliver each new issue through your letterbox before it hits stores, and you’ll also save money on the cover price. What are you waiting for?